Are you a fan of the popular Japanese Steamed Egg? This is one dish I can never refrain from ordering when dining in Japanese restaurants. 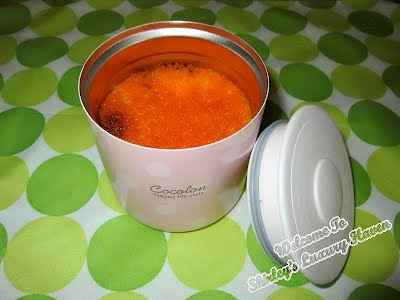 Have you tried Chawanmushi (茶碗蒸し) with Tobiko (とびこ)? The orangey-red roes are often found in Sushi. The mild smoky salty taste adds zest the steamed egg & I swear you're gonna love the crunchy bits coupled with the smooth egg texture. Try it & it’ll leave you craving for more! 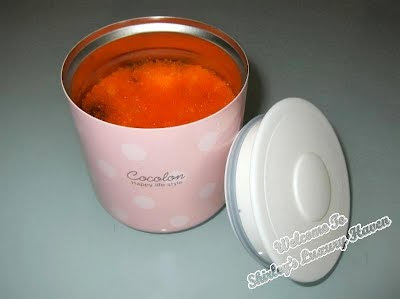 I've made this delectable Chawanmushi for my CasaBento Pink Cocolon Bento Box Kit, together with Fresh Fruits & a Teddy Bear Sandwich. Aren't they cute? Wanna #CookForFamily? I'm joining Daniel’s Food Diary to be part of the 100 bloggers for the awesome event. Check out my meal @ Singapore Bloggers Unite To #CookForFamily! A meal doesn't need to be complicated. I'm sure a simple Bento Lunch Box like this makes a difference, so let's make an effort to cook for our family this weekend! 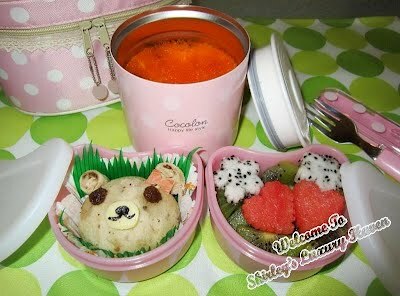 I know a lot of you are screaming for this recipe after my 1st post on these cute bento box & food. My apology for the long wait. Let's get cooking! Tip: Using egg shells instead of cups to measure water is best since the sizes of eggs vary & I like to use the ratio of 1:2. Temperature control is important too. Using high heat will result in bubbles & eggs being too hard. Beat egg with salt & broth. Strain. Placed ingredients in steaming cup. Pour egg mixture into cup. Cover with cling wrap & steam till custard is set, about 7 mins, depending on your steamer & container. Use a cocktail stick to check if egg is ready. Top with Tobiko & serve your silky steamed egg hot. Do you prefer to have Chinese-style instead? 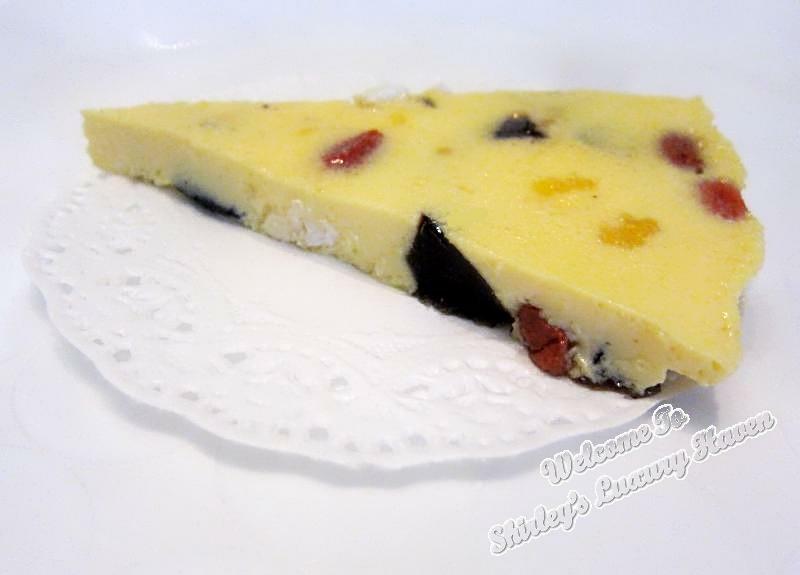 Try this Silky Steamed 3-Egg With Wolfberries (蒸三皇蛋), using a different ratio cooking the eggs. Enjoy! Mr Lonely, thks & have a good weekend! I really love that container you use to do chawanmushi. I remember you mentioning that it can be kept hot - perfect for chawanmushi. Stella, still playing with the colours...... Mixed feeling! Hahaha! Shirley, did u get my email! NuNaturals are sending your prize this week! Have fun & come back for more Giveaways! i love the tobiko topping! :D only homemade ones are great! Fish, great! Now u can try making your own. Hahaha! Love2dine, oh really? Then u must try it! Happy cooking! Shirley, that teddy bear sandwich is too cute! But what appeals to me (especially since it's breakfast time here, ha!) is the "silky egg" paired with those treasures in the bottom -- it must be absolutely wonderful. Kimby, hahaha! We're all big kids, aren't we? I'm glad u like it, dear! Jeannie, thks for your wonderful comments! Enjoy your weekend too, dear! Antonella, thks & have a good weekend! They both look fantastic, and I just love your bento box lunch...so cute! Alisha, been a while since we last exchanged words. Thks for visiting & letting me know your views :) Take care, my friend! Light and delicious! Love it. Angie. thks & have a lovely weekend! Lizzy, glad u like it too! Thks, dear! DD, hahaha! Sweetie, u're so adorable! Oh yes, I saw some of your polka dots hauls. Lol! Have fun! This looks amazing. I've eaten at many Japanese restaurants but have never ordered steamed egg! I will be on the lookout now. The packaging is so cute. No doubt the Japanese always do a wonderful job with presentation. Yum List, love bento boxes! They make food looks appetizing. yummy..it looks worth a try. hehe..
the lunch box is so cute..if i bring it to work, i dont think i can wait til lunch to eat them :p hehe..
FoodieFC, thks & have a good week! So happy I found your recipe post! And you cooked Japanese food!! Your chawanmushi looks great, and you make such a cute bento too! !